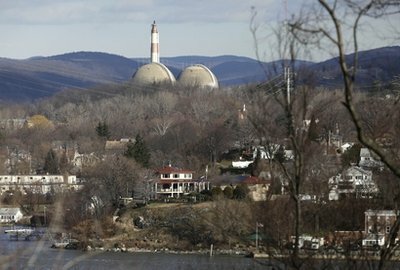 AP – In this Wednesday, Dec. 16, 2009 picture, the reactor containment domes of the Indian Point nuclear power plant. BUCHANAN, N.Y. – As America’s nuclear power plants have aged, the once-rural areas around them have become far more crowded and much more difficult to evacuate. Yet government and industry have paid little heed, even as plants are running at higher power and posing more danger in the event of an accident, an Associated Press investigation has found. Populations around the facilities have swelled as much as 4 1/2 times since 1980, a computer-assisted population analysis shows. More than 90 of the nation’s 104 operating reactors have been allowed to run at higher power levels for many years, raising the radiation risk in a major accident. In an ongoing investigative series, the AP has reported that aging plants, their lives extended by industry and regulators, are prone to breakdowns that could lead to accidents. And disaster planners from the U.S. Nuclear Regulatory Commission and the Federal Emergency Management Agency have made dubious assumptions about the public response to a major accident. They insist, for example, that people who are not called upon to evacuate will stay put; they’re now saying that they might under some circumstances tell people to hunker down at home even in the 10-mile evacuation zone, and they believe people will do it. Japanese officials ordered those living within 12 miles of the site to leave. The U.S. government’s advice to its citizens? If you’re within 50 miles, you should evacuate. And NRC Chairman Gregory Jaczko insisted that this was nothing more than what would be recommended in a similar situation at home. After a May 10 tour at the Indian Point nuclear complex, where two reactors operate just 25 miles from New York City’s northern border, Jaczko said the 10-mile rule was merely a "planning standard." He said decisions on what to do in the "unlikely event" of an accident would be based on circumstances. "So if we needed to take action beyond 10 miles, that’s certainly what would be recommended." Such a mass exodus would be an "enormous challenge" — and a historic feat, said Kelly McKinney, New York City’s deputy commissioner of preparedness. Four million people now live within 10 miles of the 65 operating sites. (Population in overlapping zones was counted only once for this part of the analysis.) Back in 1980, with 38 nuclear sites, only 1.5 million people lived that close. Overall, from 1980 to 2010, the average population in the 10-mile evacuation zones ballooned by 62 percent, from 39,762 to 64,363. Populations within the 10-mile radius have more than doubled at 12 of the 65 sites during the same 30-year period. The most explosive growth occurred around the two-reactor Saint Lucie complex near Fort Pierce, Fla., where the 10-mile population of 43,332 in 1980 grew 366 percent to 202,010 in 2010. Others in the top five: the two-unit Brunswick complex near the North Carolina coast, which increased 326 percent from 8,164 to 34,782; Monticello, 35 miles from Minneapolis, where population rose 314 percent from 14,130 to 58,538; the two-unit Turkey Point site, 20 miles south of Miami, up 302 percent; and the two-unit San Onofre facility in San Clemente, Calif., up 283 percent. Among newer reactors, the biggest jump occurred around Shearon Harris, 20 miles southwest of Raleigh, N.C., where population nearly quadrupled from 24,700 in 1990 to 94,465 in 2010. Three other facilities where populations more than doubled during the same 20-year period are the three-unit Palo Verde site, 50 miles west of Phoenix; two-unit McGuire site, 17 miles north of Charlotte, N.C., and the two-unit Catawba complex in South Carolina, 18 miles south of Charlotte. About 120 million people, almost 40 percent of all Americans, live within 50 miles of a nuclear plant, according to the AP’s analysis of 2010 Census data. Though modest population growth of 32 percent within 10 miles of Indian Point has mirrored the nation’s increase as a whole between 1980 and 2010, more people live within this evacuation zone than any other in the country: 268,906, according to the AP analysis. Population density isn’t the only concern. A 2008 Columbia University study discovered a seismic fault line near Indian Point, where another earthquake-prone zone was already known to exist. Yet a steel liner designed to be earthquake-proof has been leaking at the site since 1973. New York state has fought relicensing. Gov. Andrew Cuomo says the area can’t be evacuated in a severe nuclear accident. But when Jaczko’s talk of a possible 50-mile evacuation in the United States is brought into the equation, the prospect is truly daunting. Indian Point’s lead community evacuation planner, Anthony Sutton, at the Westchester County Department of Emergency Services, acknowledged that area roads couldn’t handle the traffic surge from a full-scale nuclear emergency. "I think in a perfect world, we’d all like to see the place in a different location, with all the challenges of evacuating the public around it," he said. Paul Blanch, a nuclear safety expert who used to consult at Indian Point but now opposes its effort for a 20-year license extension, was more blunt: "No matter what they say, they’re not going to be able to evacuate these areas." John Curry, Indian Point’s emergency director, said he believes people can evacuate from the 10-mile zone. But he acknowledges the depth of public skepticism: "It’s very difficult, and I don’t know how to make them feel any better." For the most part, though, the early sites were favored if they satisfied the criterion of "remoteness from heavily populated areas," according to the NRC’s predecessor, the Atomic Energy Commission. In 1998, federal guidelines said low-population areas were "generally preferred" because they limit exposure to radiation accidents. This was viewed as part of the NRC’s philosophy of multiple layers of accident safeguards. NRC regulations continue to require "low population zones" around prospective nuclear sites. Yet the plant was built in Citrus County on the state’s picture-postcard west coast, 70 miles north of Tampa. And by 2010 — 10 years ahead of the predicted timetable — the population had already multiplied by six, to over 1 million, the AP analysis shows. Even Dana Powers, a member of the NRC’s independent Advisory Committee on Reactor Safeguards, says his group "has had troubles with evacuation strategy assumptions." Emergency readiness was supposed to account for growth and stay up to date. The joint guidance of the NRC and FEMA in 1980 stated that "evacuation time estimates should be updated as local conditions change." In fact, according to AP’s review of government records, once plant turbines started humming, little was done to keep planning in step with population increases. A FEMA web page entitled "Nuclear Power Plant Emergency," last modified on April 8, states: "Nearly 3 million Americans live within 10 miles of an operating nuclear power plant." That’s off by one million people. Then there is the relatively new and sparsely publicized concession to escalating populations and roads that haven’t been upgraded or widened in decades. It’s called "sheltering" — if people stay put, maybe they can evacuate later, after the first wave of people has left. As part of its investigation, the AP has reported that researchers’ numbers and assumptions — along with NRC regulations — have been periodically adjusted to keep the reactors within stated limits for operating safety. Similarly, confronted with evacuation troubles, the NRC has minimized the presumed impact of accidents, allowing plants to stay on the power grid. Plant spokesman Jerry Nappi went even further when pressed. Contrary to the calculations of planners, he said he didn’t "believe a scenario like this is credible or perhaps even possible" with all the protections built into the plant. As for a 50-mile evacuation encompassing New York, he said a 10-mile radius "is already a very conservative planning zone." Nuclear planners gave similar confident reassurances about their tsunami planning in Japan. And the BP emergency plans left out Gulf of Mexico oil spill scenarios that occurred, even though they supposedly couldn’t happen. Meanwhile, the NRC’s partner, Sandia National Laboratories, has again been studying the impact of accidents. The work is still under way, but researchers have tentatively concluded that reactor defenses will work way better than believed in the 1980s. Accidents will develop more slowly than thought. Buildings designed to contain radiation leaks will hold. Responders will do their jobs. Ninety percent of those told to stay put will obey. In 2008, the NRC’s policymaking commissioners even voted to give lower-level staff the authority to approve sensitive changes that would weaken emergency plans. It had been in the purview of the commission itself. "I think the NRC wants to make sure that the evacuation side of things doesn’t make plants have to close, even if the population grows quickly," said Richard Webster, an environmental lawyer who unsuccessfully fought the relicensing petition at the Oyster Creek reactor in Lacey Township, N.J.
More broadly, the government seems careful to avoid anything fully binding in its planning requirements. It sets a supposed standard that people within 10 miles must be notified of an accident within 45 minutes. But NRC rules also say that’s not a guarantee early notification can be provided for everyone. NRC rules also concede there’s no guarantee that emergency sirens, "when tested under actual field conditions, will meet the design objective in all cases." However, she acknowledged, the exercises don’t actually send rescue workers to shelters or police officers to traffic control points. Asked for the estimated evacuation times for her site, she wasn’t sure. "The NRC rubber-stamps these evacuation plans, but they’re not based on discernible performance standards," said Alex Matthiessen, president of the Riverkeeper environmental group fighting Indian Point relicensing. "If they applied any kind of meaningful standard in evaluating the emergency plans of the nation’s nuclear power plants, there would be no nuclear power plants in this country, at least not in populated areas." Helen Henderson, who lives three miles from the reactor, is among the doubters. She said she repeatedly ignored the forms sent home by her children’s school certifying that she has read and agrees with the Oyster Creek emergency plan.